The nuclear power industry has rigorous demands for the correctness and thoroughness of project documentation. This requires not only a careful study of the extensive project specification, but often a deep knowledge of the local standards and regulations, design verification, testing and supporting documentation. Due to these stringent conditions the ability to deliver the required documentation is an important consideration when choosing a vendor. Belman is well known for its complete documented solutions, supporting even small scale projects with extensive documentation. This fact explains why Belman is repeatedly selected by nuclear power plants. Belman’s strong track record in this industry, supported by nearly 3000 pages of documentation recently convinced a Russian nuclear power plant to place an order for two DN 3000, 8 meter long expansion joints. This project had demanding requirements for both testing and documentation. Belman has been successfully operating in the nuclear `industry both directly and through EPC for more than a decade, with a series of significant projects in its reference list. Our company has recently been approved as a supplier to the Swedish nuclear power plants. A comprehensive approval procedure was also required in order to participate in the recent Russian project. The picture shows expansion joints as a connecting piece, between two ventilation units and installed at a height of 30m. Whilst having a relatively simple design, the expansion joints had to meet demanding test and documentation requirements due to the 3D safety category. In addition to the standard documentary requirements, a series of strength analysis reports were required as part of the final documentation. This included earthquake calculations, snow and wind impact analysis and bellows and middle pipe strength analysis reports. The manufacturing as well as the documentation had to be produced in compliance with Russian standards and regulations, meaning that our Technical and QA department had to study thousands of pages in a very short time period in order to comply with the project specification. Furthermore, the standards stipulated the customer’s supervision throughout the manufacturing and testing process. The final acceptance procedure included the supervision of the leak test and the review of the final documentation. The performance of a leak test was very challenging due to the relatively high pressure and dimensions of the expansion joints. Thick blind flanges, made from 12 mm thick plate, reinforced with steel strips, had to be welded on to the welding ends in order to ensure the tightness of the joints. 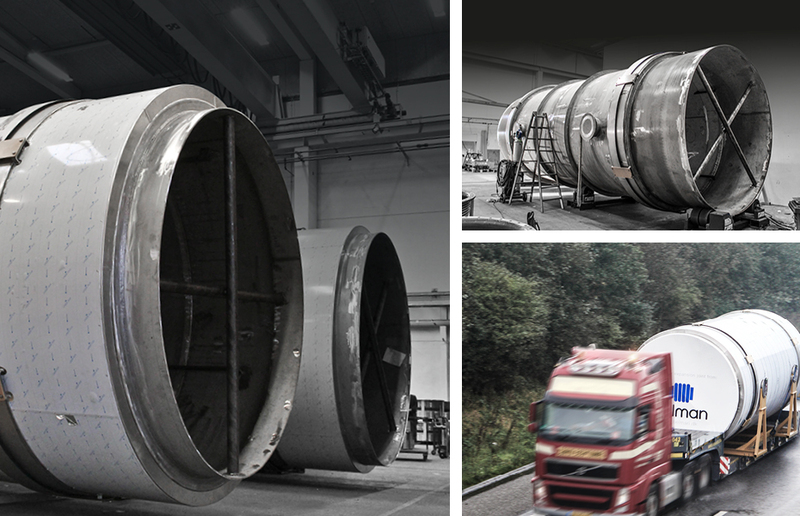 The test was performed with 0,5 bar air, that resulted in a pressure of 35 tonnes on the end plate. As the testing was performed on the very limits of the permitted pressure testing range, the testing area entrance was closed during the actual testing due to safety precautions and regulations.